BUSTAMANTE, Albert G., a Representative from Texas; born in Asherton, Dimmit County, Tex., April 8, 1935; graduated from Asherton High School, Asherton, Tex., 1954; paratrooper, United States Army, 1954-1956; studied a liberal arts course at San Antonio College, 1956-1958; B.A., Sul Ross State College, Alpine, Tex., 1961; educator; coach; assistant to Congressman Henry Gonzalez, 1968-1971; member of the Bexar County Commission 1973-1978; Bexar County judge 1979-1985; elected as a Democrat to the Ninety-ninth and to the three succeeding Congresses (January 3, 1985-January 3, 1993); unsuccessful candidate for reelection to the One Hundred Third Congress in 1992; is a resident of San Antonio, Tex. 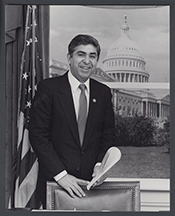 Albert G. Bustamante in Hispanic Americans in Congress, 1822-2012. Prepared under the direction of the Committee on House Administration by the Office of the Historian and the Office of the Clerk, U.S. House of Representatives. Washington: Government Printing Office, 2013.